This week, skywatchers will have the chance to catch a winking "demon star" in the night sky. The star, known as Algol, is located in the constellation of Perseus, the Hero, and has been known since ancient times as "The Demon Star." Algol has a long and venerable history. Its name comes from the Arabic word al-ghul, which means "female demon." 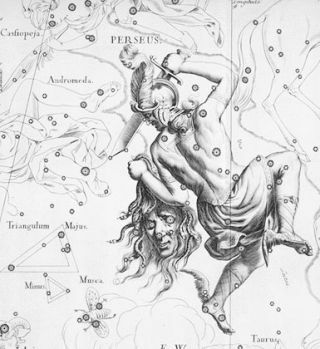 But, contrary to popular belief, the name seems to have nothing to do with the star's behavior, but rather, is due merely to Algol's position marking the head of the Gorgon Medusa in ancient Greek mythology. According to the myth, gazing at Medusa could turn a person to stone. Algol is one of the most famous variable stars in the sky, and was the first of its kind to be discovered. It is a perfect example of an "eclipsing binary" star, which brightens and dims almost as regular as clockwork. It appears that the first astronomer who definitely noticed Algol's periodic dimmings was Geminiano Montanari of Bologna, around the year 1667. At that time the only other known variable star was Mira, in the constellation of Cetus, the Whale. But, Mira's light varies over a span of many months, whereas Algol's light appears to vary over a span of just hours. Perhaps this is why few other astronomers paid much attention to Montanari's discovery. Algol's variability was rediscovered in 1782 by the English amateur astronomer John Goodricke, an 18-year old deaf mute. Goodricke watched the star systematically and ultimately determined its period. It was also Goodricke who suggested the correct reason for the variations. Unlike Mira, whose brightness varies because it shrinks and swells, a large dim body orbits Algol, periodically blocking much of its light from our view. Algol is located approximately 93 light-years away. The bright component, Algol A, is about 90 times as bright as the sun. The eclipsing body, known as Algol B, is a subgiant star that is "dim" only in comparison to the bright star; it gives off about three times the sun's light. Both stars are several times larger than the sun and their motions are almost, but not quite, in our line of sight to them. There is actually a third component, Algol C, that circles the A-B pair at a greater distance once every 1.86 years, but has nothing to do with the Algol eclipses. At its brightest, Algol is 3.3 times brighter than it is at its dimmest point. The whole eclipse requires nine hours and 40 minutes, and it occurs every 2 days, 20 hours, 48 minutes and 56.5 seconds. Magnitudes are celestial numbers that measures how bright a sky object is; the smaller the value, the brighter the object. Most of the time, Algol is a bright as Gamma Andromedae, whose magnitude is +2.1. This magnitude is bright enough to be seen even through severe light pollution. At its dimmest, at magnitude +3.4, it is distinctly fainter than the nearby star Epsilon Persei. These two stars form a line with Algol that extends out from the constellation of Andromeda and can serve as comparisons. Algol requires only 5 hours to fade from maximum to minimum. The star is at minimum for about 20 minutes during the time it takes Star B to pass across Star A, and then in another 5 hours, Algol is seemingly back to its normal bright self again. Two hours before the predicted minimum start checking Algol’s brightness; its fade-down will become increasingly apparent as the minutes tick by. Similarly, watch during the two hours following minimum for a distinct upturn in brightness. Earlier I said that Algol is "almost" as regular as clockwork. Over the years, amateur and professional astronomers who have made accurate timings of Algol’s eclipses have revealed that its period undergoes slight changes, amounting to only a few seconds. While that doesn’t sound like much, this can accumulate over a span of a year or so, causing the time of the predicted minimums to come some minutes early or late. In the table below, we provide a table for when Algol is predicted be at minimum brightness over the course of this week for various time zones. This table shows the predicted times of minimum brightness for the "Demon Star" Algol. The times are based on data taken from the 2012 edition of the Observer’s Handbook of the Royal Astronomical Society of Canada. The minimum on Sept. 8 occurs as daylight is breaking over the Eastern United States, and is thus not visible there. The minimum on Sept. 16 occurs at or before sunset for the Mountain and Pacific Time Zones. The Sept. 11 minimum can be readily seen without dusk or dawn interference from coast to coast.